Lady Shani is the current champion. She defeated Fabi Apache on January 26, 2018 to win the championship. Reina de Reinas was an annual AAA tournament, similar to male counterpart Rey de Reyes. The championship was more a tournament winning award in belt form than a regular defended championship. It still was put on the line in between Reina de Reinas tournaments occasionally, with the Mexican National Women's Championship also used as a traditional women's championship. Early Reinas de Reinas followed the same format as the male tournament - 16 person tournaments made up of 4 four-way semifinals and a final - but the format changed to a battle royal where the final four would advance in later years. Lady Apache took the Mexican National Women's Championship to CMLL in 2006, leaving AAA without a regular women's title belt. Tiffany won the 2007 tournament but left AAA along with other AAA veterans that year. The tournament was held with 12 women in 2008. AAA began using it as a normal championship from that moment on, and has stopped running the tournament. 1 Xochitl Hamada 1999.11.05 ? 1 Martha Villalobos 2000.06.16 ? 1 Miss Janeth 2001.05.09 ? 6 Martha Villalobos Lady Apache 2002.05.04 ? 8 Tiffany ? ? ? Championship vacated on September 4, 2017. Decision match for the vacant championship on October 1, 2017. The 1st Reina de Reinas tournament was held in Puebla on February 19th. It was a 16 women tournament with four way matches, and was won by Xochitl Hamada. 1999.10.06: Esther Moreno defeated Xochitl Hamada to win the Reina de Reina championship. 1999.11.05: Esther Moreno defeated Xochitl Hamada to retain the Reina de Reina championship. The 2nd Reina de Reinas tournament was held in Morelia on February 20th. It was again a 16 women tournament with four way matches, and was won by Rossy Moreno. Title defenses this year: 2000.06.16: Rossy Moreno won by DQ over Martha Villalobos to retain the Reina de Reina championship. In the four way final, Lady Apache defeated Miss Janeth, Tiffany, and Alda Moreno to take the crown. 2001.05.09: Lady Apache defeated Miss Janeth to retain the Reina de Reina championship. 2001.07.15: Lady Apache defeated AKINO to retain the Reina de Reina championship. 2001.11.29: Lady Apache fought Tiffany to a double DQ to retain the Reina de Reina championship. The 4th Reina de Reinas tournament was held in Veracruz on February 23th. Like the previous year, there was a qualifying cibernetico with the last four moving onto a final match. This year, 12 women were involved in the tournament. In the final, Miss Janeth and Martha Villalobos were eliminated, leaving Esther Moreno and Lady Apache. Some reports have the match ending as a draw, but Esther is recognized as a Reina de Reinas champion, so she must've ultimately won the crown this year. Title defenses this year: 2002.05.04: Martha Villalobos defeated Esther Moreno to win the Reina de Reina championship. Details are scarce on the 5th Reina de Reinas; it's believed to have just involved three wrestlers for unknown reason. (It's also possible there's a missing first round.) The matches took place on February 23. There was no Reina de Reinas tournament in 2004. Sometime between 2003 and 2004, Tiffany won the Reina de Reinas championship, and it was defended thru the year as normal. 2004.05.09: Lady Apache defeated Tiffany to win the Reina de Reina championship and the Mexican National Women's Championship. 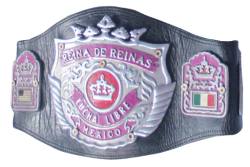 The 6th Reina de Reinas tournament was held in Mexico City on February 20th. Participants included wrestlers from the LLF female only promotion. This year, the tournament was a battle royal, with the final two wrestlers having a final decision match. In the final, Tiffany beat Lady Apache to win the crown on her birthday. 2005.06.03: Tiffany defeated Lady Apache to defend the Reina de Reina championship. 2005.07.03: Tiffany defeated Lady Apache to defend the Reina de Reina championship. and Miss Janeth defeated La Diabolica with a top rope spinning kick to win the tournament. AAA also held a special Reina de Reinas Internacional match this year, on Feburary 25th. Cinthia Moreno won an elimination match, also including a La Diabolica, Martha Villalobos, Carlos Amano, Mayumi Ozaki, Chikayo Nagashima. At the end of this melee the new Reyna of Reynas was Tiffany. This year's tournament was a fifteen women tournament in Morelia, Michoacan on May 25. The format of the tournament was changed again, this time three first round matches with five women each. The three winners would advance to a final on the same day. The tournament was made up of 9 Mexicans and 6 Japanese, most from the Oz Academy group. Previous champion Tiffany did not compete. In the final, Fabi Apache defeated Mari Apache and Ayako Hamada to win the tournament. AAA ceased running annual Reina de Reinas tournaments after the 2008 tournament. The Reina de Reinas belt was defended like a standard women's championship from that point on. Defenses are listed in the title history. On September 26, 2009, as part of the Heroes Inmortales III show, Sexi Star beat Fabi Apache in a bull terrier match to win the championship. Mari Apache's championship win came in a trios match, where the AAA World Mixed Tag Team Championship were also on the line and whoever got the pin got the championship of whoever lost. Mari lost the championship in a multi-woman match. She was beat before the finish by guest wrestler Mickie James, but James was kissed and defeated by Pimpinela Escarlata to win the match. Pimpinela, an exotico, became the first male to win the championship in 2011. Sexi Star won the title a second time at Guerra de Titanes, 2011. The match versus Pimpinela Escarlata was a lumberjack strap match, with a distraction caused by the lumberjacks leading to the title switch. Sexi Star held the championship for more than a year before vacating the championship on AAA TV in February 2013 for reasons not totally explained. AAA brought back the Reina de Reinas tournament format for a special co-promoted show with WAVE promotion from Japan on November 27, 2012 in Korakuen Hall. There was a four lucahdora field for a one night tournament. AAA recognizes this as a single title defense, not an additional reign. This page was last edited on 10 April 2019, at 08:53.